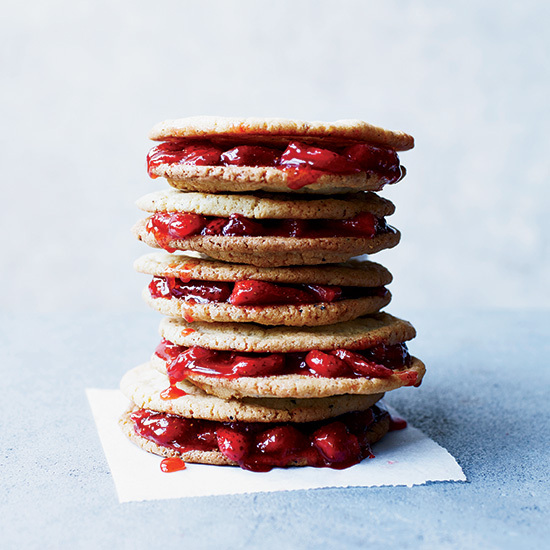 These sweet and savory cookies, with their strawberry jam filling, are terrific on their own, but, of course, we like them best dipped in even more strawberry jam. Luckily, the recipe makes a little extra jam—it’s also excellent on toast, muffins and angel food cake. With cookie season just around the corner, it’s time to think about shaking up your usual baking routine. In this video from the 2015 Food & Wine Classic in Aspen, mad genius dessert expert Christina Tosi of NYC’s Milk Bar demonstrates how to make a few of her weird, wacky and crazy-delicious cookies, like Ritz Cracker Cookie and Salt-and-Pepper Cookies (we like them best layered with strawberry-lemon jam). Watch the video to see Tosi bake her amazing desserts and share some essential cookie-baking tips.